Create and Develop better lines of communication and collaboration within healthcare departments. Monitor all business units at a high level with or without deep diving into a single account or case record. Enable managerial oversight and data compliance at all times. By adopting Sysco Healthcare, you’ll gain easy access to information on all suppliers, business units and contacts from a single, shared platform. View KPIs on Business Units and Individuals from out of the box or custom made dashboards and charts. Keep contact information up to date and add additional information via free text or pre-ordained drop down options. Categorise contacts by suppliers, customers and employees to find the right person quickly or use Sysco Healthcare’s Global Relevance Search to deep dive relationships between contacts, suppliers, documents, tasks, activities and more. 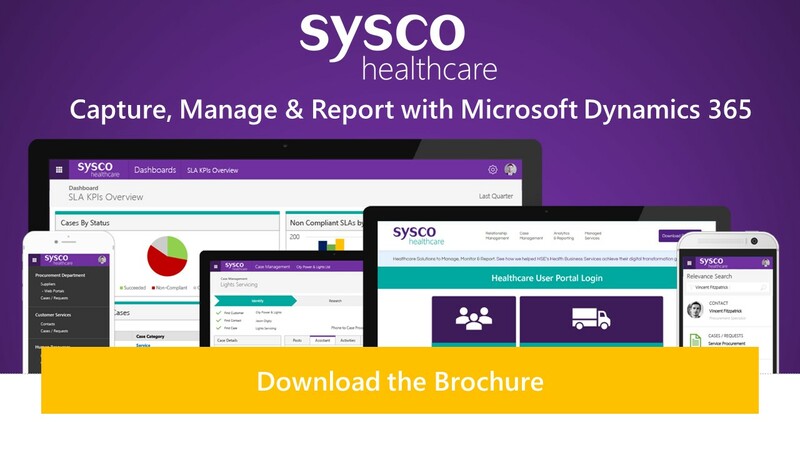 Automatically store, track and ‘Set Regarding’ tasks, activities and emails from Outlook and Sysco Healthcare’s Business Relationship Management Platform. Since all information is coming from a single source of truth, staff receive a 360 view of all interactions. Sysco’s Healthcare platform goes beyond a database of records and data. Take for instance the on-boarding process of a supplier. That business process can be mapped into Sysco Healthcare meaning that every supplier has the same consistent, approval process. From Registration to Qualification through to Supplier Evaluation, Compliancy Checks and final sign off and approval. Search across contacts, deals, appointments, meeting notes, email messages and more.